Mozilla implemented a feature called Scroll Anchoring in Firefox Nightly recently that fixes a very annoying scrolling related issue. Here is the issue: open any site with a good number of images or other content and quite a bit of text. Scroll down while the page still loads and stay on a fixed position. The loading of content such as images changes the position on the page. I experience the issue regularly, for instance when starting to read a long article or text on a site without waiting for all content to be loaded on it. The loading of images and other content that takes up space may move the visible part of the page so that I have to scroll again to go back to the position I was at. Images, media, and other content on the page may not be loaded immediately. It depends on various factors such as size of files or the number of images on the page. Tip: check out our Firefox download guide to find out how to download Firefox Nightly. We suggest that you use different profiles for Firefox. The issue may be experienced on dynamic pages as well that load content as the user scrolls the page. Bug 1305957 on Mozilla's bug tracking site, Page scroll position is not consistent while content is loading (implement "scroll anchoring"), was opened two years ago. Mozilla plans to launch the change in Firefox 66 Stable and has already implemented in Firefox Nightly, the cutting edge development version of the browser. Scroll Anchoring support in Firefox fixes the issue. The visible part of the page remains in sight while the page is loading if the user scrolls down before the load event completes. Google implemented Scroll Anchoring some time ago in the company's Chrome browser. 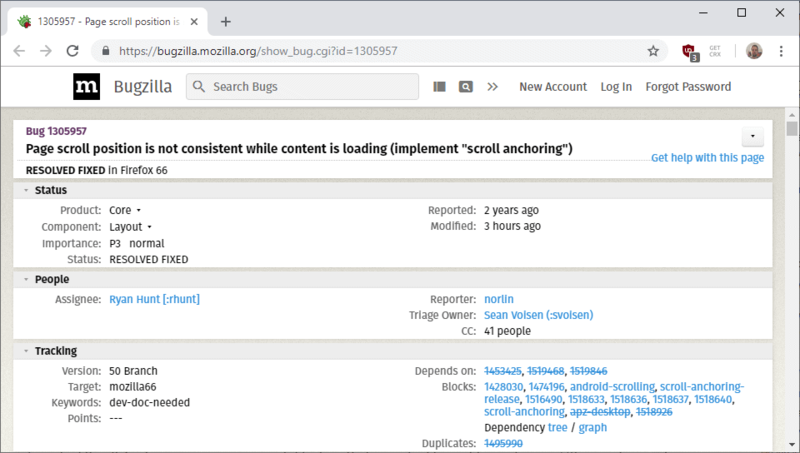 The company launched Scroll Anchoring as an experimental feature that users had to enable on chrome://flags and enabled the feature by default back in 2016 for all users of the browser. The implementation of Scroll Anchoring is a welcome addition to the Firefox browser as it resolves an annoying issue that some Internet users ran experienced. Now You: What is your take on Scroll Anchoring in Firefox? About time! An annoyance for over a decade. Scrolling in general and above a jump is smooth and controllable. Hit a jump, no telling where you end up. Chrome’s (Chromium’s in our case) anchoring is nice while their scrolling speed is all over the map; crazy fast at times. Thats what I was thinking when I read this…. do we need browser bloat to fix poorly done websites? One of the better pieces of news I’ve gotten today. Sounds good. But why not implement it in 64.0.x or 65.0? Scrolling is one of the few things Chrome does better. The other is automatic realtime full-page translation that works even in chat. Something seems to be ‘wrong’ here. Most of the recent changes (*one* per ‘version’ … oooh!) I’ve read about Firefox seem to be sensible fixes. Even long-term bugs like this are being looked at. FWIW, whist Quantum has been a source of great consternation, it should be acknowledged that “changing the engine whilst the jet is in flight” has seemingly gone extremely well. A massive achievement that appears to have delivered some speed improvements. It still a shame they forced the butchering of addon APIs along with the long-awaited improvements from Servo though. Yep, I can tell you what happened. Yahoo/Oath/Verizon is not paying for 2018 and certainly neither for 2019. When you get $375 million for no work whatsoever you become arrogant and lazy and the whole company culture suffers. When actions don’t have consequences, they don’t matter. I suspect yearly revenue going down at least $200 Million in 2018 to around $300 Million, and management had the final numbers on the table a couple of weeks ago. Mozilla still suffers from the diversity virus. Mozilla is a religious organization and most brilliant people have long fled the company due to the racist and discriminating undertones. When those people are not allowed to speak because it is more important to have someone with a special sexual orientation or skin color or health issue on the stage than something is seriously wrong. But at least now they will feel the direct result of their actions in their pockets. Perhaps so. I’m not part of that dev team, so I have no idea how hard this is to accomplish, but I don’t want to take anything away from them either. How well its gone, though, isn’t important to me because it’s resulting in a browser that is growing increasingly worse for me. Safari is now the one remaining major browser on Mac that doesn’t have this. I bet they’ll do it within a year. The website where I most often see the problem is Google Image Search. Bing does it too. Regardless, I’m going to be looking forward to the fix in Firefox, my browser of choice still. This is so necessary, it made browsing image heavy forums and sites with Firefox a real pain. Joke aside, this planned ‘Scroll Anchoring’ is welcomed of course, if it works correctly. But it shouldn’t have to be necessary if concerned sites had and kept in mind that a homepage is not meant to display an encyclopedia but a menu, an index, more or less furnished, but not, never one of those never-ending pages which gets on everyone’s nerves. I could not agree more. One of my pet peeves about the web these days is how badly most sites are designed, and it’s a problem that seems to be getting worse, not better. Sounds good, although to be honest this has been a thing for so long that my normal workflow works around it anyway, so I’m not sure I’d notice. Very good news, thank you !